Who doesn’t love going for a walk with their dog? There may come a time, however, when your furry friend can no longer accompany you on your usual stroll. Fortunately, there are ways to still bring even large dogs along on walks so they can continue to sniff in the sunshine! Are recovering from surgery, or have a medical condition that requires limited physical activity. Are too old to keep up with you and your younger dog on your usual walks. Aren’t fit enough to keep up with you on your workout, but would still enjoy coming along. Have smooshed faces (are brachycephalic), and should not be walking for long distances. Have thick fur coats and struggle in the heat of summer, but still enjoy being outside. You may have seen your neighbor walk by with their chihuahua or bichon in a dog stroller, but there are a variety of companies that offer strollers for larger breeds as well. Here is a list of some of the best dog strollers for large dogs out there so your pup can continue joining you on your outings! Sounds intuitive, but make sure that your dog will fit comfortably inside the stroller! Most strollers on this list are rated to a certain weight, but that doesn’t necessarily mean that a particularly tall or leggy dog under that weight will fit in the carriage. Also, consider whether your dog will likely ride sitting up (need a taller stroller) or lying down (need a longer stroller). Often dogs who are riding in a stroller are doing so due to physical disabilities. Some strollers have doors in the front and rear, allowing a dog to enter and exit without turning around inside (also a plus if your dog is too large to turn around in the stroller). The height of the door off the ground is also something to consider if your dog might struggle stepping or jumping up into a taller stroller. Consider where you will most likely be walking with your stroller-bound hound. If you will often travel over rougher uneven surfaces like dirt and gravel, or plan on jogging with the stroller, consider looking for a stroller with inflatable rubber tires like those on a bike. For flatter ground and smoother pavement, smaller plastic wheels will likely serve you just fine. Evaluating the weather where you live will help you make this decision. Some strollers are made of waterproof material or come with a rain cover, while others do not. In some cases, a rain cover can be purchased separately. In any case, it is important that there is plenty of airflow through the trailer so your dog can smell the air and learn about his surroundings. It is important to ensure that the stroller you buy is not going to be too heavy for you to maneuver or lift into your car. It is also a good idea to measure your doorways and consider how wide of paths you will walk on. Make sure you get a stroller that will fit through your door and won’t be too wide to walk with. If you are using the stroller temporarily to help out a dog recovering from injury, or if you plan on driving with your dog and stroller for walks, you will likely want to get a folding stroller for easy storage. If your car has a small trunk measure its dimensions against the size of the folded stroller to ensure that it will fit BEFORE you purchase a stroller. Common safety features on dog strollers include visibility aids, reflectors, brakes, and leashes or restraining devices attached inside. Will you be walking after dark? Look for reflective strips or tiles! Do you live in a hilly area? Look for a stroller with an easy-to-use brake! Is your dog particularly wiggly? Ensure that there is a secure restraining device to keep him in the stroller! Also, make sure that the stroller is sturdy and well made. You’re going to be pushing a lot of dog in there; it shouldn’t strain or fall apart! Strollers made for big dogs are large and can be heavy. Add the weight of your hound, and that is a lot to push around! Look for a stroller that is easy to push, steer, and stop. A good stroller should also be easy to assemble and fold up. Many large dog strollers come with cool features, such as storage pockets, removable floor pads, and even a bike trailer conversion kit! If you require coffee on your morning walk, look for a cupholder on your stroller. If you are particularly tall or short, check to see if the handlebar is adjustable. If you often bring your dog shopping or on all-day outings, make sure the stroller you choose has plenty of storage space for all of your and your dog’s belongings. Whatever stroller you choose, ensure that its size and features will be compatible for you, your walking locations, and your dog. Avoid strollers that are difficult to set up or walk with, and those that will not fit your lifestyle or your dog! Description: This stylish stroller with two zipper doors has a durable aluminum frame and large inflatable tires that allow it to travel over rougher surfaces. Users report that it is sturdy and easy to use. While it is pretty expensive, many buyers insisted it was worth the extra money. Wheel Type: Two large inflatable (bike style) quick-release rear wheels and a small inflatable front 360° swivel wheel. Top Cover and Airflow: Good airflow through both mesh doors, mesh panels on the sides, and a zipper opened mesh window in the roof. Comes with a rain cover. Safety Features: Reflective tiles on the large wheels, two leashes attached inside, footbrake. Bells and Whistles: Sleek, stylish design. Quick-release wheels detach and the stroller collapses to fit easily inside the trunk of a small car. The rear entrance has a handy storage pocket. Pros: Users reported this stroller is easy to assemble, push, and maneuver. They liked its sturdiness and the adjustable push bar, and the inflatable shock-absorbing tires allow for travel over gravel and other rough surfaces. This stroller is 13” off the ground, which is a relatively easy step up for an old or injured dog. The fact that it collapses down to fit in a car is a big plus as well! Cons: Some users had trouble inflating the front tire. You will also need a bike pump to use this stroller; a pump is not included! Some users complained about having to take off the tires to collapse the stroller (although many said this was easy). Description: This stroller provides a comfortable ride for your dog, with robust rubber tires and a steel frame. It resembles a child’s stroller, and comes with the copious amounts of storage one would expect of any good stroller. Wheel Type: Two medium sized back wheels, two small 360° revolving front wheels. All are rubber (pump free). Top Cover and Airflow: Retractable canopy fixed with buckles (not zippers like many other strollers) that is part mesh, part canvas. There is also a rear mesh window. Safety Features: Front and rear braking system, two leashes attached inside. Bells and Whistles: This stroller consists of a sturdy steel frame that folds with a push of your foot to collapse for easy storage, and includes a large undercarriage and three pockets for storage, as well as a cup holder. It also has a reversible handlebar and comes with two machine washable pads for the floor of the stroller. Pros: Users enjoyed the sturdy frame and durable rubber wheels of this stroller, as well as the fact that it comes completely assembled, and folds for easy storage. Cons: This stroller easily fits medium sized dogs (beagles, bulldogs, etc.) but is probably not the best option for very large breeds. 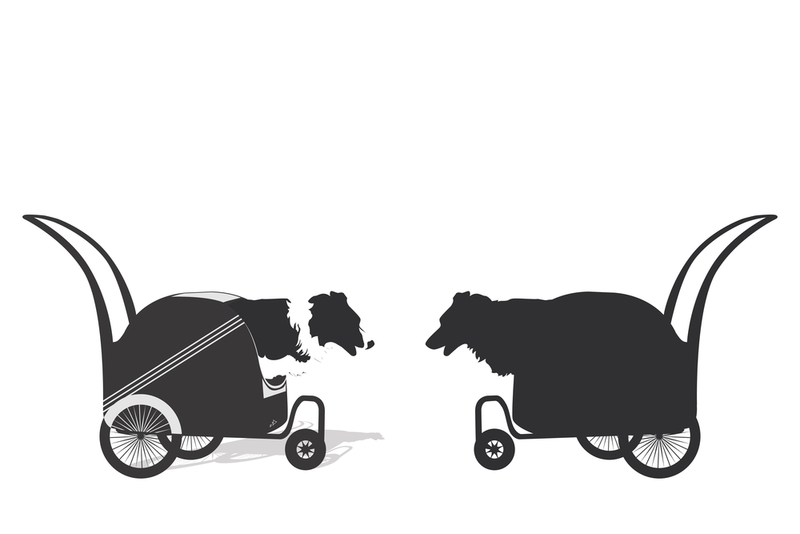 The stroller carriage is high off the ground, which could make entering and exiting a challenge for a dog that cannot jump, or does not tolerate being lifted. Description: This pet stroller comes with a hitch to easily convert it into a bike trailer. It also incorporates just about every commonly used stroller safety feature and costs significantly less than many other options on this list. Wheel Type: One 9.5” front wheel and two 19” rear wheels, all of which are made of rubber and inflatable with a bike pump. Top Cover and Airflow: Multiple mesh panels and doors on the front, back, sides, and top provide ample airflow. Safety Features: This stroller has multiple safety features, including a visibility flag, reflective tiles on the front of the trailer and the two large wheels, leashes attached inside the carriage, and a hand lock brake system. Bells and Whistles: This stroller comes with a trailer hitch for conversion into a bicycle trailer. Large wheels, a lightweight steel frame, and water resistant polyester make this stroller a good option for any conditions. Pros: The myriad of safety features included in this stroller are sure to attract some buyers, and this option is also the cheapest on this list. Despite its lower cost, it has a good rating with more than 200 reviews! Add to that the fact that it can easily be converted into a bike trailer and it’s easy to see why so many buyers are pleased with their purchase. Cons: According to some users, this stroller has a thin floor that might not comfortably support all dogs. It is also a tight squeeze for large or leggy/tall dogs and is probably best used for medium-sized breeds or multiple small dogs. Description: The DoggyRide stroller resembles a bike trailer with its large rubber tires and can be converted into one with a separate conversion kit! Users enjoy its easy maneuverability and sturdy build, although it can be a pain to assemble. Wheel Type: Two large inflatable (bike style) rear wheels and a small front 360° inflatable swivel wheel. Top Cover and Airflow: Top cover is mesh, with a removable window up top, and mesh panels on the sides provide added airflow, although a clear plastic rain cover can cover the front door if needed. Rear door is solid material. Safety Features: Brake on the left rear wheel, reflective strips on front and sides, and wheels. 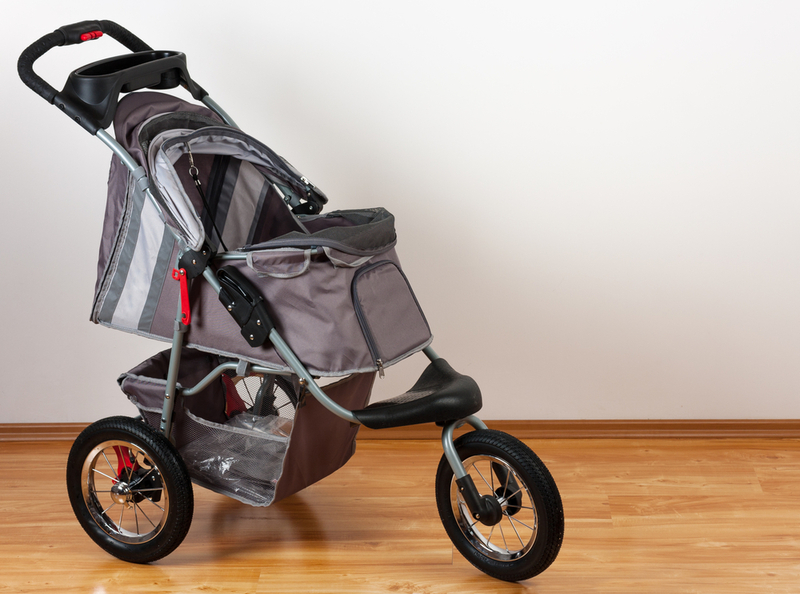 Bells and Whistles: This stroller includes a cushioned headrest at the front window, quick release wheels for collapsible storage, and the wheel assembly can be removed so the carriage can be used as a crate. Pros: Users report that this stroller is easy to steer, can handle rough terrain, and provides ample room for large dogs (one owner walked their two golden retrievers in the stroller!). You can also purchase a bike trailer conversion kit and go biking with your dog! Cons: For some users assembly proved to be difficult, particularly attaching the handlebar. This stroller is also one of the pricier options on this list, although most users agree that it is worth the extra money. Description: This pet stroller boasts a no-zip technology, and opens from the front or the rear with the push of a button. 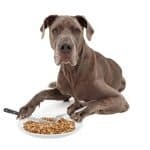 Because it is low to the ground and opens from both ends your pet can easily enter the stroller and will not have to turn around inside to exit, which is a huge plus for an injured or elderly dog, or even a very large dog who cannot turn around within the confined space. Wheel Type: Two 6.25 inch plastic/EVA front tires and two 11 inch plastic/EVA back tires. Top Cover and Airflow: Mesh doors or panels on the sides, rear, and front provide ample airflow. A rain cover can be purchased separately. Safety Features: This stroller includes a foot brake and a leash attached inside the compartment. Bells and Whistles: This stroller opens from both the front or the back with the push of a button. The handlebar height is adjustable, and the interior pad is removable for easy cleaning. Pros: This stroller handles well, even with a 100+ pound dog aboard, and users enjoy its easy assembly and its ease in folding for storage. Cons: Users report that this stroller, although it can support up to 150 pounds, does not easily fit a dog that large (e.g. Great Pyrenees). Some buyers also found that the plastic wheels were not very durable on anything other than flat, smooth pavement. Description: The Towerin Large Pet Stroller is simple, but sturdy (enough to carry 120 pounds!). 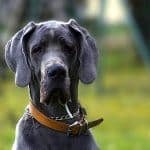 It is a solid option for large breeds at a more affordable price. Wheel Type: Four small plastic wheels. Front wheels swivel or can be locked in place. Top Cover and Airflow: Mesh panels on all sides provide ample airflow. There is one door in the front, and a window in the top so your dog can sit upright with his nose in the open air. Safety Features: This stroller has a brake on one of the rear wheels, but does not include any visibility aids. Bells and Whistles: This stroller is made from waterproof fabric and includes a rear pocket for storage. Pros: This stroller is low to the ground, so old or arthritic dogs have little trouble getting in, and users liked the roomy interior and storage pocket. Cons: Multiple users found this stroller to be difficult to assemble alone. Some also found that it was too wide to fit through some doorways. How Do I Teach My Dog To Enjoy Riding In The Pet Stroller? 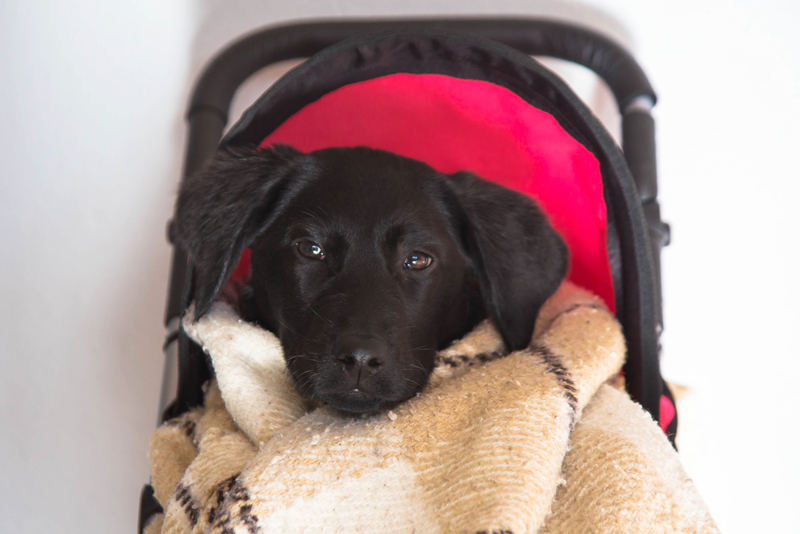 Riding inside a confined stroller can be a scary experience for any dog, especially one who doesn’t like riding in cars, or being confined to a crate. 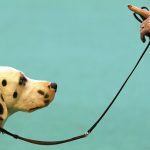 Training your dog to get used to riding in a stroller is very similar to crate training. Have patience; it may take considerable time for your dog to get used to comfortably riding in the stroller. Don’t expect to go for a long walk as soon as the stroller arrives at your house! Let your dog sniff and explore the stroller, and reward her for doing so. Then, with all the doors open, reward her for stepping inside (make sure the brake is on!). Do not lure or drag your dog inside. With your dog comfortably inside the stroller, try closing the door, and then letting her out again right away. Reward your dog! 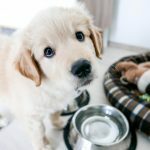 Repeat each of these steps until your dog is comfortable and happy with all of these behaviors. This may take some time; have patience! Once your dog is happily sitting inside the stroller, try some slow, gentle movements. If your dog is sitting comfortably and isn’t nervous about being moved in the stroller, you’re probably good to go! 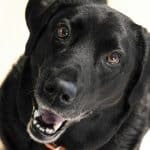 Try going for a short walk outside, keeping in mind that your dog might react differently to her surroundings from inside a stroller than she normally did while walking beside you. Remember to slow down if your dog is uncomfortable, and repeat these steps as many times as your dog needs. Be patient! Before long you and your furry friend will be cruising down the street just like normal!